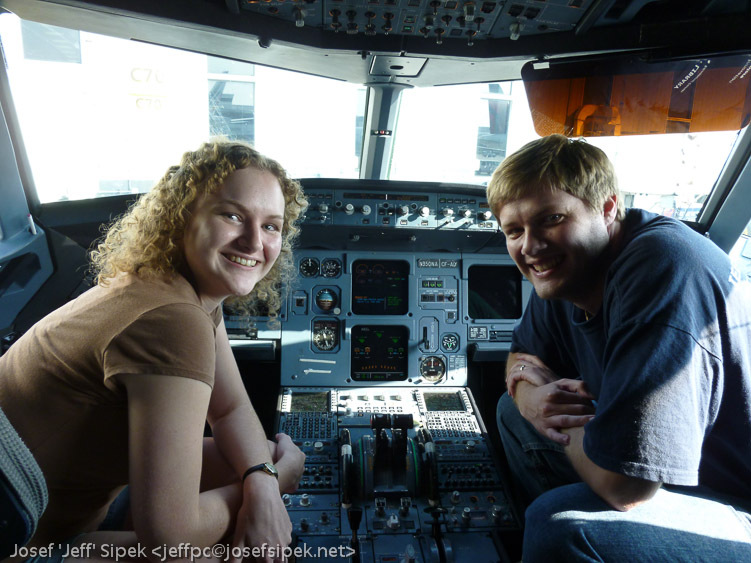 Josef “Jeff” Sipek » Private Pilot, Honeymooning, etc. Early September was a pretty busy time for me. First, I got my private pilot certificate. Then, three days later, Holly and I got married. We used this as an excuse to take four weeks off and have a nice long honeymoon in Europe (mostly in Prague). Our flight to Prague (LKPR) had a layover at KJFK. While waiting at the gate at KDTW, I decided to talk to the pilots. They said I should stop by and say hi after we land at JFK. So I did. Holly tagged along. I am impressed with the types of displays they use. Even with direct sunlight you can easily read them. After about a week in Prague, we rented a plane (a 1982 Cessna 172P) with an instructor and flew around Czech Republic looking at the castles. I did all the flying, but I let the instructor do all the radio work, and since he was way more familiar with the area he ended up acting sort of like a tour guide. Holly sat behind me and had a blast with the cameras. The flight took us over Bezděz, Ještěd, Bohemian Paradise, and Jičín where we stopped for tea. Then we took off again, and headed south over Konopiště, Karlštejn, and Křivoklát. Overall, I logged 3.1 hours in European airspace.